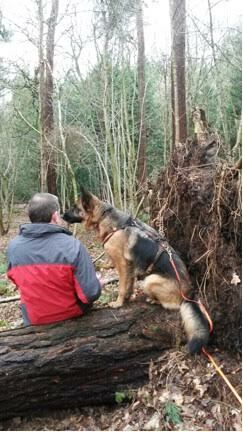 Following an injury, Donna (Merry’s handler), has had to withdraw Merry from our Search Dog training programme. Merry will continue to attend Warwickshire Search and Rescue fundraising and PR events. She will be at B&Q, Binley Woods in the afternoon of Sat 11th Aug (other team members are there from 10.00). Pop along and see her with your good wishes. 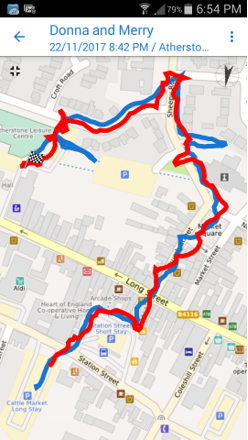 Kev, A WarkSar team member, recorded the blue trail as he walked. 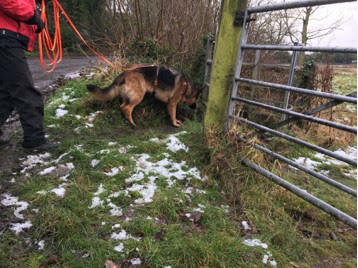 Ninety minutes, later Merry was given the scent article and trailed Kev’s route. The red trail is hers. Once she had found Kev, he emailed his trail to Donna and the two trails were combined to produce the image above..
“Found you! You can’t escape me. The nose knows”.